The first one is a small book called Pot Pies:Forty Savory Suppers. I bought it at a garage sale for a quarter. Now that the weather is crap and it's snowing here I'll have to start reading it. Next is The Nasty Bits, Scott bought it for me for my birthday. I just started reading it and so far it's pretty good. Next to that is a book I bought used Laurel's Kitchen Recipes and next to that is Rachel Ray's 30 Minute Get Real Meals. I also got that one for my birthday after I went on a (drunken) rant one night about how I like the idea of Rachel Ray, but she is just a bit...much for me to watch on TV. 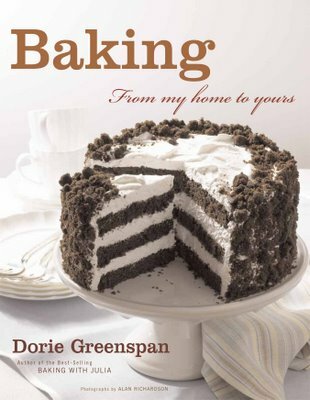 I have a mini-review of this book planned; we had company a couple of weekends ago and I cooked a bunch of food out of it. What: Root vegetable, related to Swiss Chard. When: Spring to Fall. Beets are tolerant of cooler weather, able to extend the growing season into the late Fall. Where: Originally from Europe beets will grow almost anywhere, although they favor a cooler climate. 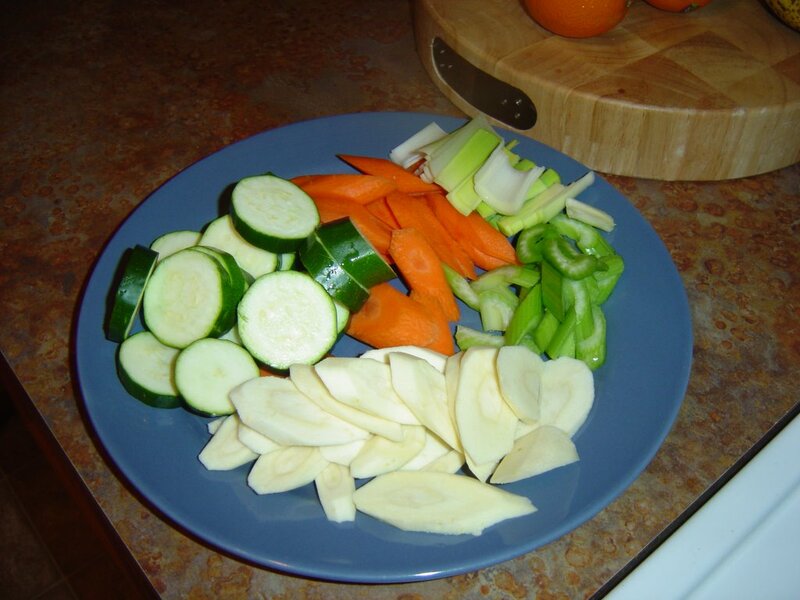 Why: The root (the most commonly eaten part) is high in Vitamin C, Fiber and Folate. The greens (best eaten from young plants) are high in Vitamin A. Beets are commonly found in Borscht, pickled, canned and raw. Pickled Beets are eaten as a condiment. Raw Beets can be shredded into salads, boiled, steamed or roasted. Preheat oven to 350'. Scrub beets and cut off tops and bottoms. Place in a single layer on a large piece of aluminum foil. Drizzle with olive oil and season with salt and pepper. 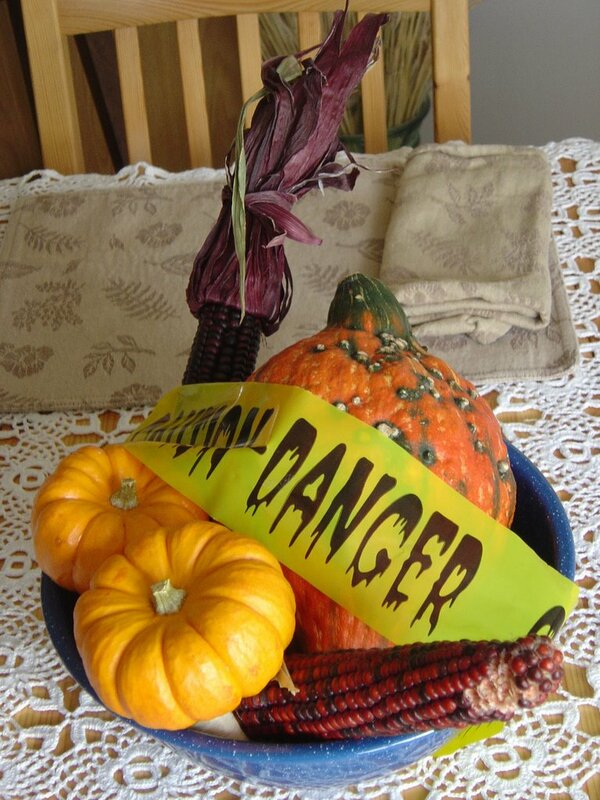 Wrap tightly in foil and bake for 1 hour or until beets are easily pierced with a sharp knife. Cool roasted beets to room temperature. Using 3 or 4 paper towels (or a dish towel you don't care about wrecking) briskly rub the beets one at a time, until all the skin is rubbed off. Cut the potatos and beets into chunks. Cut the beans into thirds. Wedge the tomatos and eggs. 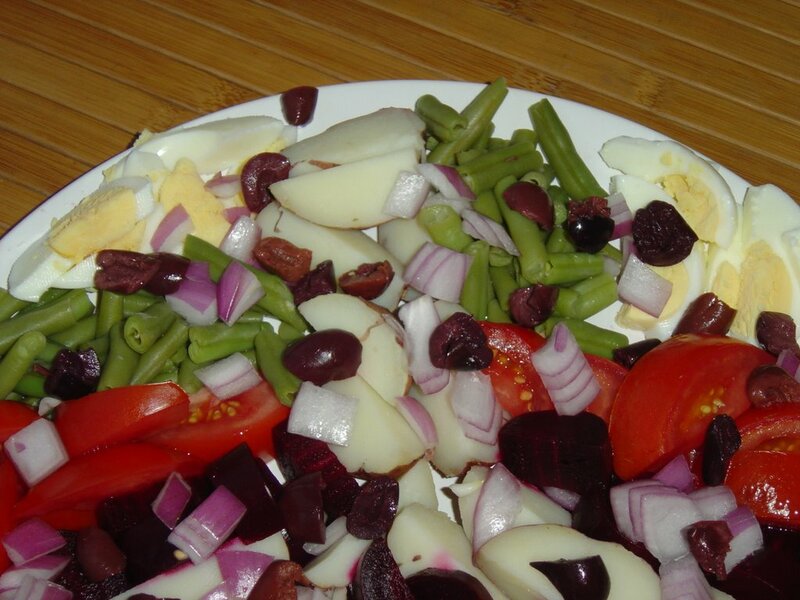 Arrange all the vegetables and eggs if using on a large platter. Scatter the olives over the top. Whisk all the ingredients for the dressing together. Drizzle the dressing over the salad and serve straight away. Sauteed Beet Greens with Lime and Garlic from Kickpleat at Everybody Likes Sandwiches. Beetroot Cured Salmon from Haalo at Cook Almost Anything At Least Once. Roast Beet Salad with Goat Cheese from Gabriella at My Life As A Reluctant Housewife. Beet Marshmallows from McAuliflower at Brownie Points. I have always wanted to try Pot au Feu, with its frou-frou name and vegetables cut on the diagonal. How fancy! It is also pretty healthy which is always a plus. So here we have our veggies - 2 carrots, 2 celery, 1 1/2 turnips (they were sort of big) some leeks and a small zucchini. 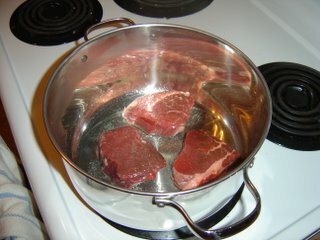 I bought a pack of tenderloin steaks and browned them with some non-stick spray. I added 4 cups of chicken broth, the veg, 2 cloves of garlic that I sliced in half, 2 sprigs of lemon thyme from the slowly dying plant on the floor, and some pepper. Simmered it for 20 minutes, discarded the thyme and garlic, removed the steaks and sliced into thin strips. 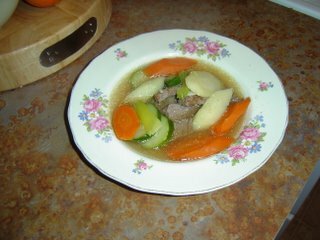 Then put a couple of pieces of steak in each bowl with some vegetables and broth. It was just lovely, very flavorful and filling, but still a light meal that didn't leave us feeling weighed down. 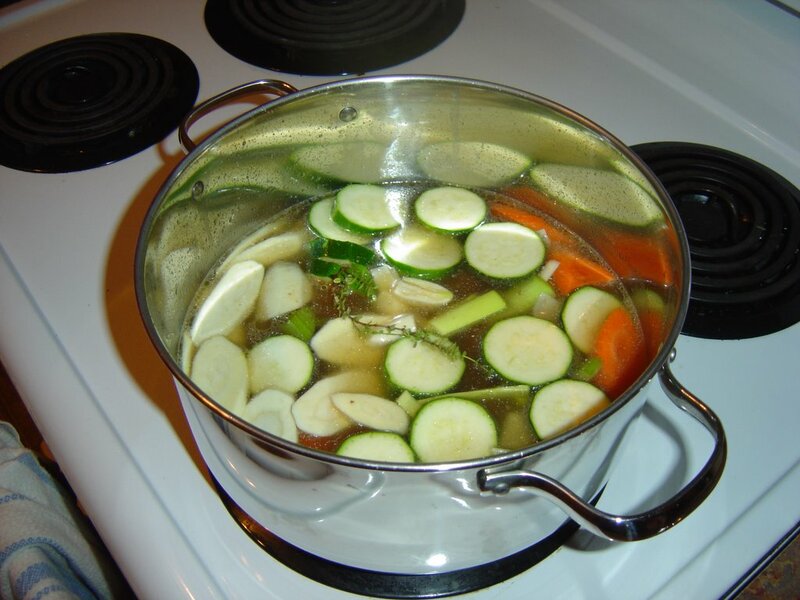 The tenth installment of The Weekend Cookbook Challenge is being hosted by Mary at The Sour Dough and she chose a fantastic theme - to use a neglected gadget/appliance in our kitchen. This is a great theme because I doubt anyone out there doesn't have at least a couple of gadgets they bought with good intentions that got shoved to the side. I know I do. My kitchen and basement and full of them! A while back I wrote about how much I hated my George Foreman grill until I grilled wraps in it. Turns out that the grill is a good panini maker, but I never used it again after I wrote that post. Until the theme for WCC 10 was announced. Thanks Mary! 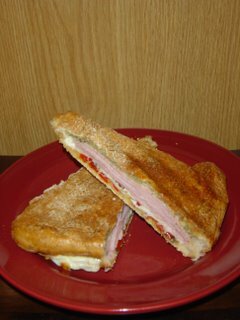 I chose to use a cookbook I've owned for only a short time; Simple Italian Sandwiches by Jennifer and Jason Denton and Kathryn Kellinger. I am really enjoying reading this book. In addition to the panini's - of which they are many to choose from- there are condiments and sauces, salads, appetizers and non-grilled sandwiches. You don't have to own a panini grill (or any grill) to enjoy this book, although it would help. 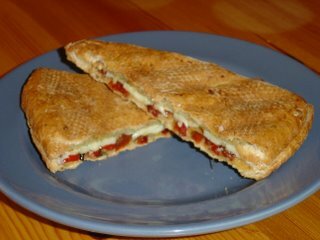 I chose 2 sandwiches to make, the first was the Mozzarella, Basil Pesto and Peperonata Panini. 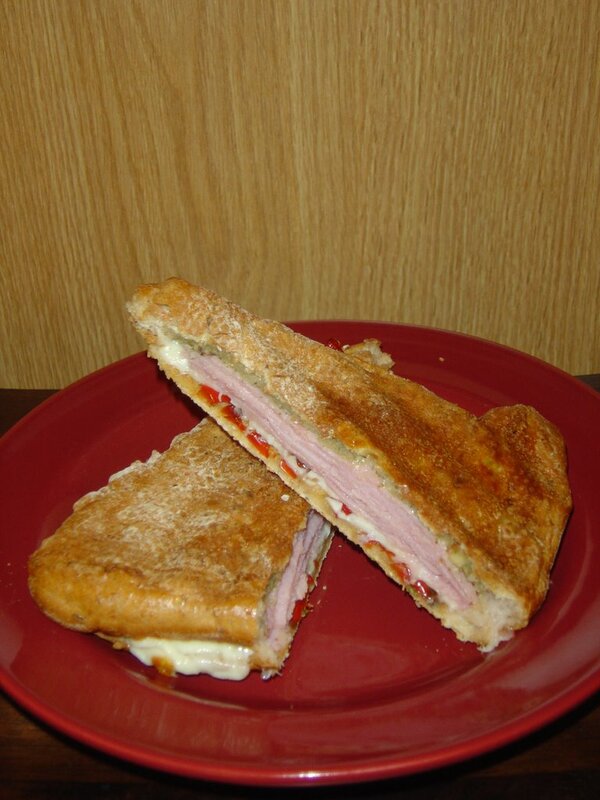 The sandwich is full of gooey melted cheese, homemade pesto, and homemade peperonata. I don't really like pesto much because most prepared pesto is made with pine nuts and I can't stand those things. For this recipe, I just omitted the pine nuts and increased the amount of walnuts slightly. I don't know if butter is usually an ingredient in pesto, but it was here. The pesto was very very good. I cut back the recipe as I was only cooking for two but I regretted that after I had tried the sauce. Delicious! Scott had 2 panini - 1 regular and 1 with ham added. The ham one was mighty fine too. Dessert was truly eye opening. Up until this dinner I had never eaten Nutella. That has changed, for I have seen the light and become a convert. That stuff is good. And it's even better when smeared between 2 pieces of white bread and grilled. 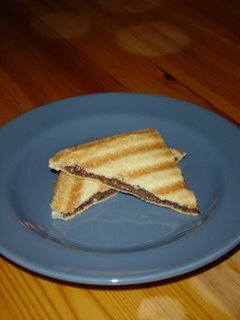 You sure don't need a recipe for that; if you have any kind of panini grill, george foreman grill or even a grill pan, you must try a Nutella Panini! Your life will never be the same. Have you taken part in the Weekend Cookbook Challenge yet? There's still time! Email a link to your post to this month's host Mary at maryATbreadchickDOTcom by November 3. We'd love to see you there. Starting this week for 26 weeks, I am going through the alphabet food-wise. Each week I'll do a post on a food or cuisine that starts with that weeks letter. How much fun with that be? Hopefully some. Let's find out. What: A leafy vegetable and a member of the thistle family. When: Peak season is March thru May, but they are readily available year round. Where: Louisiana and California grow almost all artichokes sold in North America. 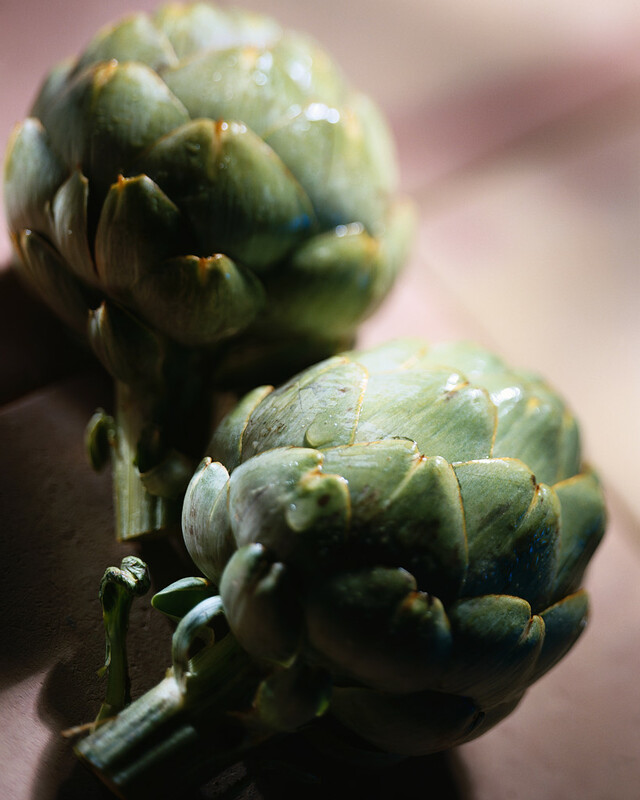 Why: Artichokes are good sources of Vitamin C, Potassium and Folate. They are also fat free. For years it seemed the only way artichokes were served was steamed whole, with butter or mayonnaise on the side for you to dip the leaves in. Now the hearts (the best part) turn up everywhere: salads, pasta, pizza, sandwiches; you are only limited by your imagination. 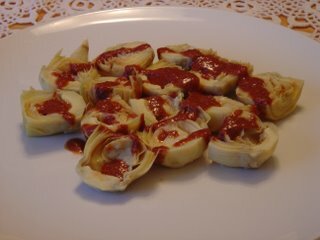 In addition to buying them whole, you are also buy artichokes canned, marinated in jars and frozen. If you want to learn how to clean and cook artichokes, click here. Cut 3 - 2" circles out the bread, giving you 24 total. Spread one side of each round with a small amount of butter, and press, butter side down, into a mini muffin tin. Drain and chop the artichokes roughly, then mix with the cheese, pepper, mayonnaise and lemon juice. Season with salt and pepper, then fill the tart shells. Bake for 15 minutes at 425'. Be sure to let cool for 5-10 minutes before serving. Cut the hearts in half (or quarters if they are large) and place on your serving plate. Put the garlic in a food processor and chop. Drain the artichokes, add to the processor and chop again. Add the mayo and cheese and pulse to combine. Season with pepper to taste, and spread on the baguette slices. Jasmine from Confessions of a Cardamom Addict is the lovely hostess of Canadian Blogging By Post 2 - Our Seasons Bounty. While I am definitely not a winter/fall person, I'll admit I do love the big piles of squashes, beets, apples and corn at the markets this time of year. One food that always makes me think of fall is apples. In the fall when I was a kid my mom would buy big bags of apples and make all sorts of treats - apple pie and apples cored and stuffed with brown sugar and nuts and then baked were two of my favorites. But my very favorite was her apple sauce. Saturday nights my mom would fill her crock pot with peeled apple slices sugar and spices and when I would wake up in the morning the house would smell so good. The sauce was thick and full of big apple pieces and dark brown from all the spice - nothing like the yellow pureed sauce you buy in the stores. Ah memories! 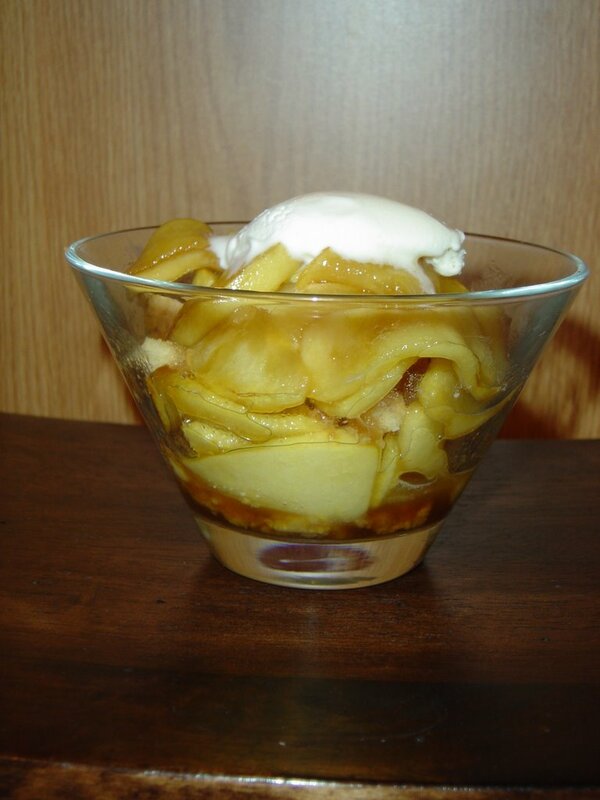 This is a newer favorite apple dish of ours. I hate to admit it, but this dessert makes me sort of glad the weather has cooled down a bit. Don't tell anyone! Preheat broiler. Lay apple slices in a single layer on a baking pan. Sprinkle the brown sugar over the slices, then drizzle the butter over the top. Place under the broiler and cook until the sugar has melted and the apples are soft and starting to color, stirring once or twice. Remove from oven. Meanwhile, in a small saucepan or microwave safe bowl, mix the maple syrup and brandy together and heat until very warm. Take half of the cookies and sprinkle them in the bottom of 2 bowls. Top each bowl with 1/4 of the apples. Scoop a small spoon of ice cream onto the apples and drizzle each with a spoonful of the brandied syrup. Repeat with the rest of the cookies and apples. Place another scoop of ice cream on top and another spoon or two of sauce. For Blog Party 15 Stephanie from Dispensing Happiness chose a literary theme, asking us to come up with some treats inspired by or from a novel. At first I thought this would be a piece of cake. It was a lot harder than I thought! But finally I picked one of my favorite stories by one of my favorite authors, but probably most if not all of you won't have heard of him. Stuart McLean is a Canadian author, journalist, teacher, radio host and performer. He is the author of many books including the popular Vinyl Cafe stories. He has a radio show on the CBC and also tours Canada. Scott and I have been lucky enough to see him twice in the past couple of years. My favorite story of his is from his book Home From the Vinyl Cafe and is called "Dave Cooks the Turkey". It's also available as its own book and is on Stuart's Christmas Collection CD. It is a priceless, hysterical story; Dave decides to help out his wife Morley at Christmas by offering to prepare the turkey dinner while Morley takes their children to help at the Food Bank on Christmas Day. Dave does not realize until he goes to bed on Christmas Eve that preparing the turkey also means buying the turkey. What happens next...well, you really should read it yourself to find out. In honor of Dave and because we Canadians had our Thanksgiving dinners on the 8th, I made Turkey Quesadillas. 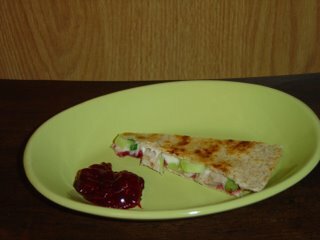 Spread 1 tb of cranberry sauce on each of the quesadillas. Top one with half the cheese, the onions, broccoli, and turkey. Sprinkle the rest of the cheese over and top with the other tortilla, cranberry sauce side down. Heat a large pan over medium heat and spray lightly with non stick spray if desired. Place the quesadilla in the pan and cook until the bottom is lightly browned. Carefully flip the quesadilla over and cook until browned and the cheese has melted. Remove to a cutting board and let stand 3 or 4 minutes before cutting. Cut the quesadilla in half, then cut each half into fourths. Serve with extra cranberry sauce on the side. **I made my cranberry sauce from the recipe on the side of the cranberry bag but cut the sugar by half so it wasn't so sweet. I have recently discovered Nutella; it is the best stuff on Earth. Where has it been all my life and why did no one tell me about it sooner? 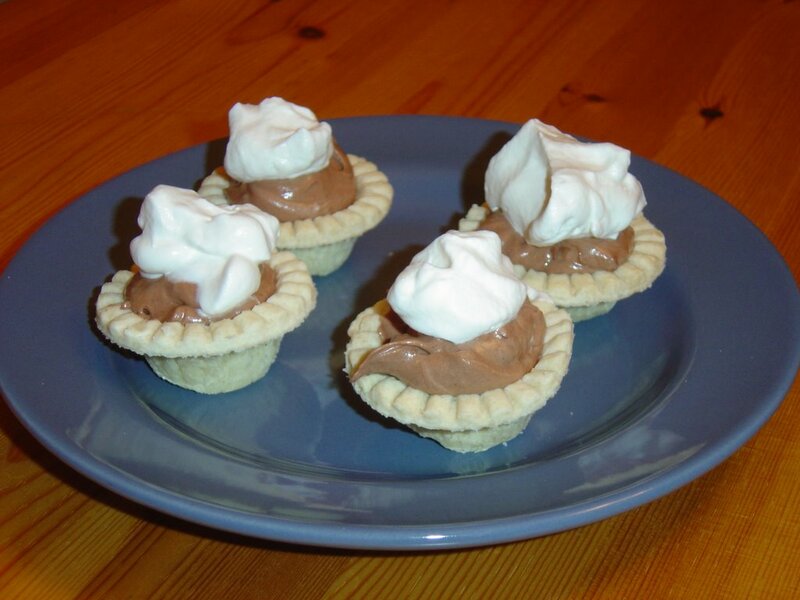 I whipped up a little chocolaty treat for the party - Nutella Tarts. I filled baked mini tart shells with Nutella and whip cream blended together, then finished with a dollop of regular whip cream. These went fast let me tell you. I made 8 for 4 people and probably should have doubled it at least! Our drink veered us close to Christmas territory what with the turkey and all. But the stores started selling Eggnog here earlier this month and my boss for some reason bought bottles for everyone at the office. We added rum to ours, but it's just as delicious plain with a sprinkle of nutmeg. I am totally thrilled and excited to tell you about a project in the works. My friends at Houghton Mifflin Publishing Company offered up 25 copies of their newly released book Baking: From My Home To Yours by the wonderful Dorie Greenspan. I sent out the call to some fabulous bloggers who agreed to check out the book, cook a recipe or two and tell us all about it. 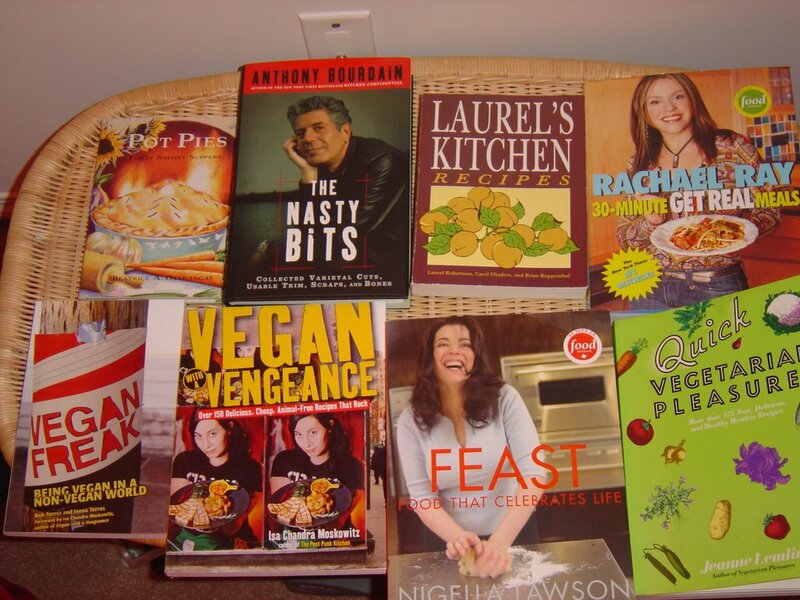 In a few weeks, after eveyones had their fun with the book, I'll have the round up posted both here and over at Weekend Cookbook Challenge. You'll be able to see what the bloggers from Canada, the US, Australia and Germany thought of this scrumptious work of deliciousness. 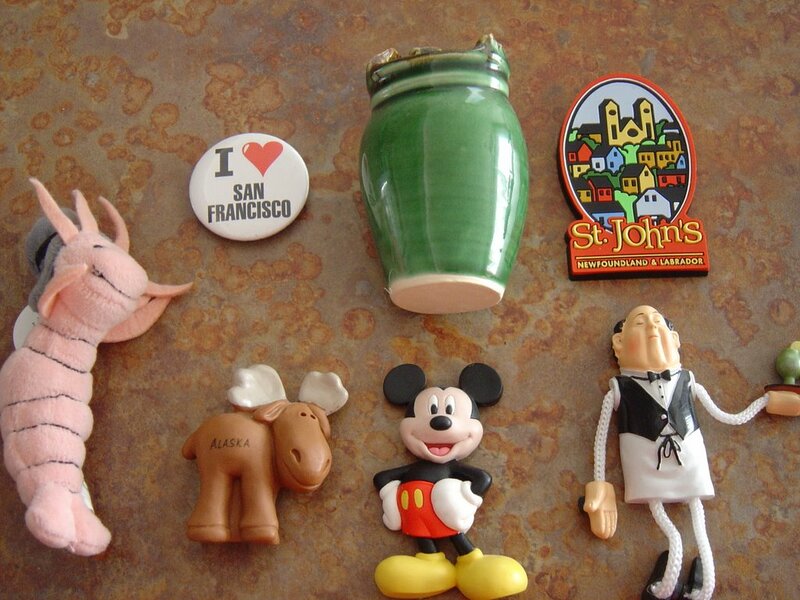 magnet collection. Last night I pulled all the magnets off my fridge so I could do the same. 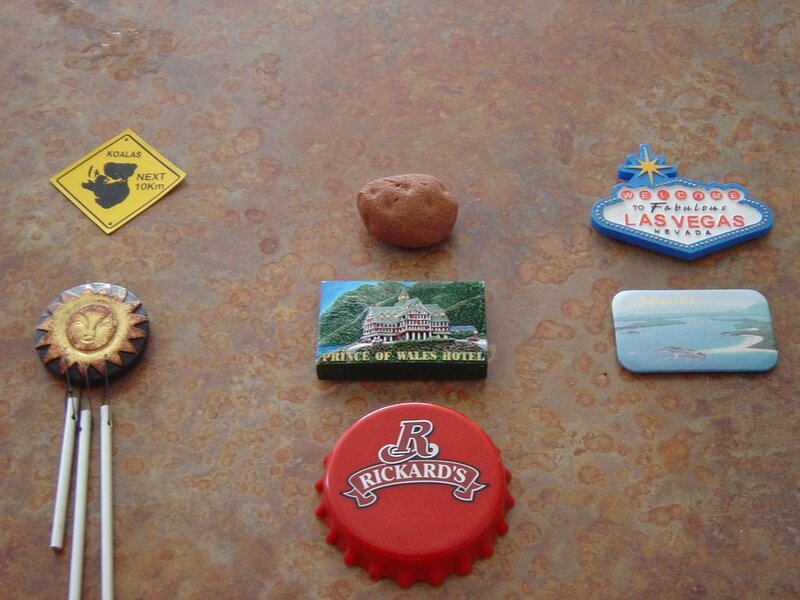 Koala Crossing magnet from Australia (gift - I have never been), a potato magnet from Prince Edward Island (never been there either) and a magnet from our trip to Las Vegas. sun wind chime from Australia, Prince of Wales Hotel magnet from Waterton, one from Tofino, BC. Free with purchase magnet that doubles as a beer opener. Classy! I heart button I bought in San Francisco and turned into a magnet, a vase magnet, a magnet from my parents recent trip to Newfoundland. 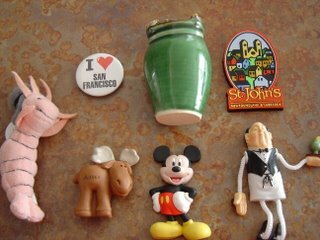 A Shrimp magnet from the Bubba Gump Shrimp Company in San Francisco, a moose from Alaska (haven't been there either), a Mickey from Disneyland, and a waiter magnet. The waiter has magnets in his hands so you can pose him. 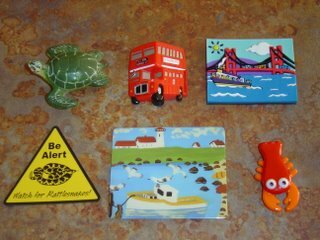 a turtle from Cayman Islands (haven't been there), double decker bus from England (nope, not there either), Golden Gate Bridge in SF. 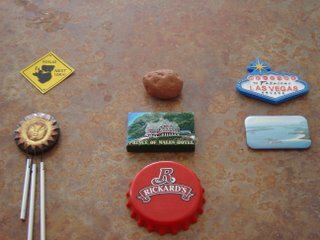 Beware of Rattlesnakes magnet from B.C., another from Nova Scotia, and a glass lobster I bought at Millarville last year. 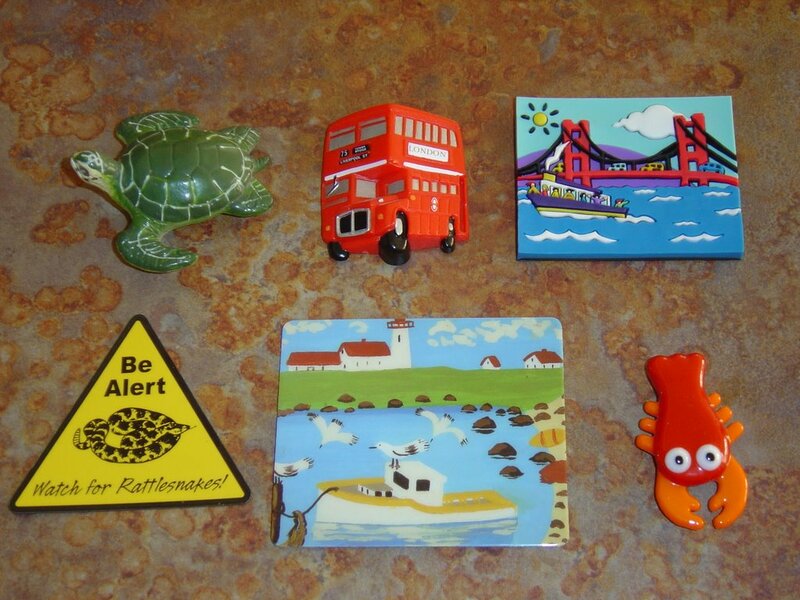 Well, obviously my magnet collection is much better traveled than I am! So, what's holding up the junk on your fridge? Meeta from the gorgeous blog What's For Lunch Honey hosts the Monthly Mingle, another great food event, and another one that I always miss out on. But not this month! This time around I was primed and ready to take part in Monthly Mingle 5 - Take Two in which Meeta gives us two ingredients to use in our dish. 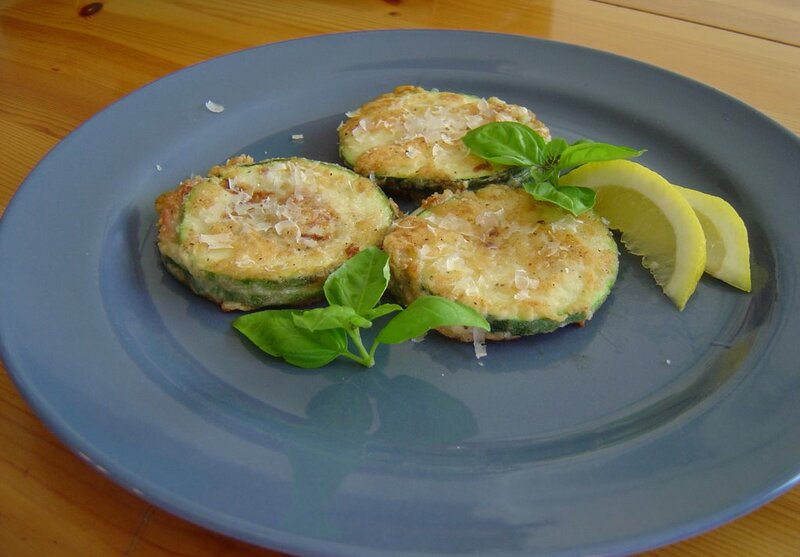 Meeta chose sage and zucchini (squash) which thrilled me as I love both. 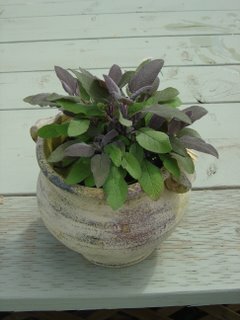 AND I could use some delicious leaves off my lovely sage plant. 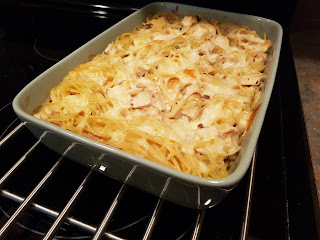 I got the idea from a recipe on the food channel - you can see it here. Our zucchini were quite large so we cut them into rounds instead of lengthwise. This was a super idea as it turned the saltimbocca's into little "sandwiches" that were easy to hold in your hand and eat. I used mozzarella instead of fontina and didn't bother with exact amounts of ingredients. They came together in a snap and were a huge hit at dinner. Thank you Meeta for hosting the Monthly Mingle. I enjoyed taking part this month and look forward to seeing what the next Mingle will bring. Spicy Beef and Potato Curry from Meeta at What's For Lunch Honey? 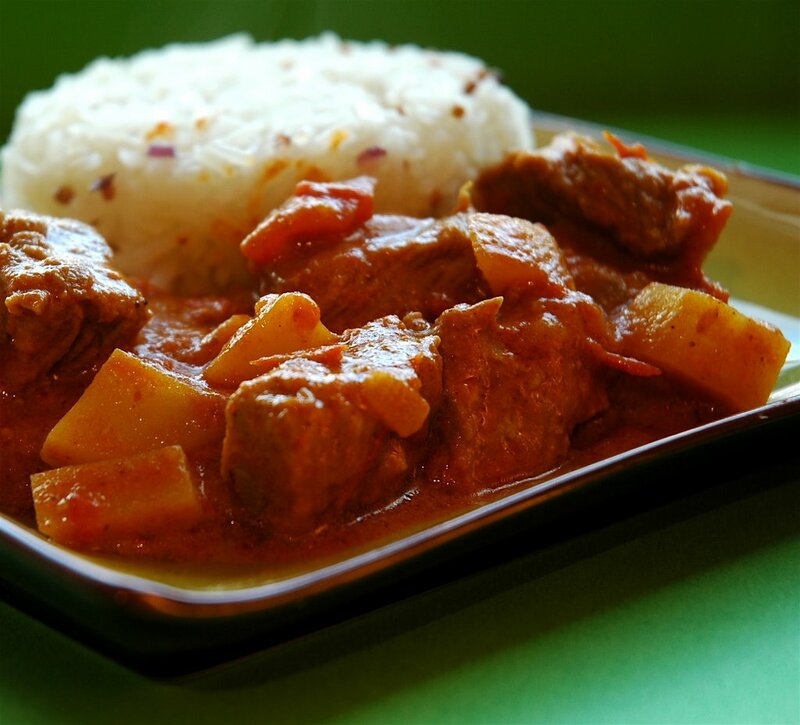 The post for Weekend Cookbook Challenge #9 is now up, so go check it out if the mood strikes you. WCC #10 will be hosted by Mary of The Sour Dough. Email a link to your post to her by Friday November 3. Mary's email is snddsn1 AT fmail.co.uk. Flatbread with Mint, Tomato and Halloum Cheese with too much information. Two Saturdays ago I was in a funk. (This is the too much information part.) I spent the morning laying facedown on the couch, blocking out everything in the world but the sounds of The Food Channel. (I know! I think I was more depressed than I realized.) I resisted all of Scotts efforts to cheer me up or even to get me to move off the couch until Nigella came on. I perked right up when she made her Halloumi and Tomato Flatbread. That's what I want for dinner, I announced. And so it was. According to my "The Complete Encyclopedia of Cheese" Halloum (the books version on the spelling) is a very popular cheese from South-East Europe. 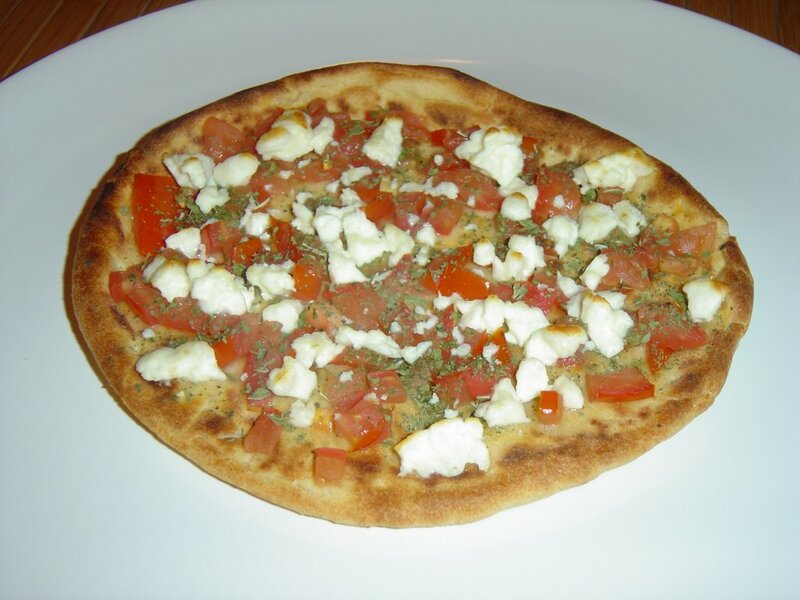 It is fairly firm in texture with a taste similar to feta which means salty. My book says it is not a cheese to be eaten on it's own, but is best for broiled or oven baked dishes. Nigella grilled hers on the barbecue; her recipe is in her Forever Summer Cookbook. This is my version. I don't think you need a recipe, just guidelines. Preheat your broiler. Place the flatbread on a baking sheet. Spread the tomato over the flatbread and sprinkle with the mint. Top with cheese and broil until the flatbread and cheese start to lightly brown. The cheese will not melt.